Whether you’re watching this month’s blockbuster release, catching up with your favourite series, gaming, or utilising your screen for a variety of other multimedia purposes, a Logik TV is the ideal home entertainment system for you. Our Logik television range is composed of a wide array of high-performance products, that includes HD Ready 720p, 4K Ultra HD and Full HD 1080p devices. Available in various sizes and designs, we have the right television for any space, budget or specification. If you’re looking for a Logik TV that’s able to offer a stunning level of detail, crystal clear picture, and incredible performance, we’ll be able to help you in the right direction. All of our LOGIC range is designed to offer fantastic value for money, ensuring everyone is able to watch their favourite shows and films in picture perfect high definition. As one of the most popular products in the Logik TV range, the Logik L55UE17 55" Smart 4K Ultra HD LED TV is the perfect choice for anyone looking for a powerful and versatile television that will satisfy all of your multimedia needs. 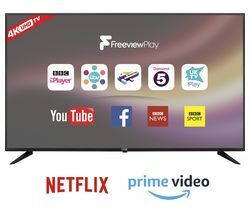 Boasting a number of incredible features, including built-in catch-up and 4K streaming, 4K Ultra HD picture, Freeview HD, and 2 HDMI ports, it’s an excellent example of what an Ultra HD TV is capable of. Beyond our Logik television range, we stock a diverse array of televisions from some of the industry’s leading manufacturers. Whether you’re looking for a Panasonic, QLED, Sharp or Sony product, we’ll have the right TV for you. So view our range of smart tvs online, get in touch with one of our friendly and knowledgeable team members, or pop into one of our shops if you have any questions. We’re always happy to help.